A small eye device is predicted to have a huge impact on the future of diagnostic screenings. Officially called a "Micro-ring" this transparent device can be placed inside a contact lens and measure a patient's oxygen metabolic rate and blood flow. The Micro-ring is able to easily decipher all this vital health info just by examining the back of a user's eyes. The story of the Micro-ring dates back to 2006. That's when Northwestern University's Professor Hao F. Zhang began work on hotoacoustic imaging . For those who are unaware, photoacoustic imaging uses light and sound waves to produce clear images of various biological materials. Many scientists are now using photoacoustic imaging for nanoscopic cellular imaging and breast cancer screenings. As Dr. Zhang was working on photoacoustic imaging and retinal imaging technology, he was approached by Professor Amani Fawzi. Dr. Fawzi, who teaches ophthalmology in Northwestern's Feinberg School of Medicine, wondered if Zhang could use these technologies to develop a diagnostic device able to measure vital biological data from the back of a patient's eyes. Zhang quickly embraced Dr. Fawzi's idea and put together a team of researchers to help make Fawzi's vision a reality. Zhang first contacted Chen Sun, a professor of mechanical engineering at Northwestern, to join him on this endeavor. Zhang then hired Hao Li and Biqin Dong, both post-doctoral fellows, to help develop this new diagnostic device. These researchers knew from the start that the building of this device was going to be a huge challenge. 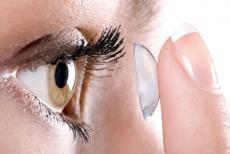 Not only did the device have to fit inside a contact lens, it also had to be soft and transparent. Before considering putting the device inside a disposable contact lens, the Northwestern team tried making a small detector which could be placed on a person's eyelid. Unfortunately, they found out early on that this method wasn't able to get the data they needed for a good diagnostic procedure. It was only after the group decided to place a transparent device in a contact lens that they began work on the Micro-ring. Today, the Micro-ring resonator is made of plastic and can produce biological images with a resolution well in the hundreds of megahertz. The Micro-ring has a diameter of 60 micrometers and a height of 1 micron. All in all, it took the team roughly three years to complete the first successful Micro-ring. Both Zhang and Sun kept detailed notes of their proceedings, and they published them in a recent edition of the journal Transactions on Biomedical Engineering . Although the Micro-ring hasn't been released to the public just yet, professionals in a wide range of fields are interested in getting their hands on this device. In particular, urologists and neuroscientists want to use the Micro-ring to help them better understand diagnostic procedures. Interestingly, geologists also believe they can use the Micro-ring to detect the movement of tectonic plates. Zhang told reporters he was stunned to learn that his diagnostic device could be implanted into the earth's surface to better predict earthquakes. Although the Micro-ring is quite successful, it is still not perfect yet. That's why the Northwestern team continues to tweak their Micro-ring with the help of the Argonne National Laboratory and the National Science Foundation.